A Rifleman's poem - Neuve Chapelle. 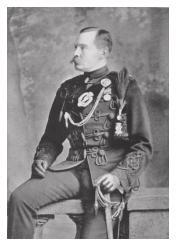 Lt Col George Brenton Laurie, the Commanding Officer of the 1st Battalion The Royal Irish Rifles. During the third day of continuous heavy fighting at Neuve Chapelle, he was shot and killed at 1720 hours on 12 March 1915. As he rose to lead a charge, revolver in hand, his last words were 'Follow me, I will lead you!' A bullet struck him to the right of his nose and killed him instantaneously.